Gordon Peery started playing contra dance piano in the late 1970’s He was fortunate to be in the neighborhood of Bob McQuillen, who was an inspiration and mentor. Though Gordon quickly evolved his own style of playing, he was permanently influenced by Bob’s commitment to providing a solid bass line for dances. 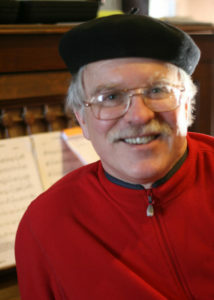 Gordon was the piano player for the band Fresh Fish, (with fiddler Kerry Elkin), which became a nationally prominent contra dance band. They toured the country extensively between 1985 and 1995, and produced a recording, “Turning of the Tide”. During that time Gordon also played with the New Hampshire Fiddlers Union, with Rodney Miller, Randy Miller, and Skip Gorman. That group was featured at the 10th Annual Shetland Folk Festival. The NH Fiddlers Union produced a cassette recording. “The Music of John Taggart”. Gordon also plays on several recordings with Gorman. More recently Gordon enjoyed a couple of great years with a band of young musicians, Trip to Nelson. Their recording “The Winding Road” is available on CD Baby and Spotify. Gordon has been on the staff and led piano workshops at many dance/music camps, including Pinewoods, Ashokan, and Augusta, and Camp Backup. He is thrilled to be adding Maine Fiddle Camp to this list. Gordon notes that in addition to traditional New England influences, his playing is flavored by jazz pianist Oscar Peterson, and 1960s rock and roll:The Rolling Stones, The Byrds, The Beatles, and Brian Wilson. The combination of all of his sources of inspiration may account for why one fan described his playing as barrel house Irish. Gordon’s piano workshops are always tailored to the goals of class attendees, with two primary areas of focus: the importance of solid rhythm, and providing a dramatic “movie soundtrack” background for tunes.